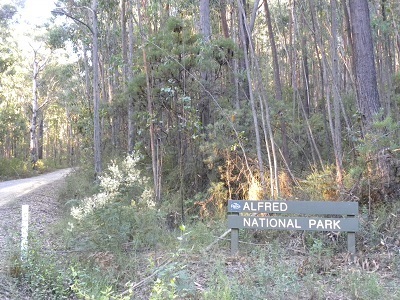 Like Lind National Park there are no facilities for visitors at Alfred National Park. Parks Victoria suggest that glimpses may be gained of the park as you travel along the Princes Highway. The Department warns that there is no-where to stop and the highway is busy. We found that the road narrows every so slightly through this area as it travels through a cutting. Parks Victoria indicated that the Park has very high conservation value for both flora and fauna. The line drawing map in the parks brochure for Croajingolong National Park shows both Lind and Alfred National Parks. If you check the map you will see that the West Wingan Road which we took to gain access to Croajingolong National Park passes by Alfred National Park and we found a great access spot at the southern corner of the Park. I was amazed at the dense nature of the temperate rain forest. You would need to take a compass and or GPS to venture more than a few metres into the Park. Thanks to the ten amateurs who gave me a call at Alfred National Park, therefore ensuring a successful VKFF activation. My first contact was at 06:52 with VK3EK/P3, Robbie on SOTA summit VK3 VK 144; VK3MRG/P3, Marshall at VK3 VN 030; VK5NIG/P5, Nigel in Wingfield Conservation Park; VK3FKSA, Banaar; VK2NNN, Darren; AX5PAS, Paul; VK2MCB, Philip; VK3FQSO, Amanda; VK3AMB, Bernard and finally, VK7HKN, Kevin near Launceston.